Mr. Derek Lalonde has been named the recipient of the 2015 Airdrie Business Leader Award presented by the Airdrie Chamber of Commerce. This is the sixth year for this award, which is part of the Airdrie Business Awards program. “The nomination we received stated – . 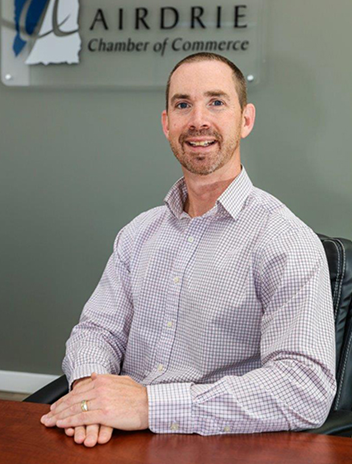 In addition to running his successful business, Derek is highly involved in many business groups and charitable organizations in Airdrie. He is an energetic, positive and helpful individual with an unselfish and genuine passion to help everyone he meets and it is because of these qualities that I feel Derek is most deserving of the Business Leader Award. The selection committee agreed” says Lorna Hunt, Executive Director of the Airdrie Chamber and member of the selection committee. Derek’s passion for the Airdrie community and businesses was cultivated in his family home. “My Dad was always giving back in our home town through Lion’s Club and Volunteer Fire Fighting so I told myself when the time was right I would give back to my community by getting involved to support Airdrie’s businesses and associations. I also feel inspired by the Airdrie Community to get involved as Airdrie has a culture to give back” says Derek.